Peter Schmeichel for Carlisle United job? A surprise new name has emerged as one of the bookies' favourites for the vacant manager's job at Carlisle United. The former Manchester United goalkeeper Peter Schmeichel is being suggested as one of the front runners to take over from Gregg Abbott, who was sacked on Monday. Schmeichel won a host of major trophies with United and captained the team to victory in the Champions League in 1999. He also won the European Championships with Denmark. "As players we haven't been doing our job"
“This is a special club, because it’s my first club as a manager, and there are some special people here. “I am absolutely grateful for the opportunity to become a manager and learn another side of this industry. “At times it’s been tough, at others it’s been fantastic. “The dressing room is absolutely flat, because they feel for me and I feel for them. At no point in this relationship have either of us turned our back on each other." "I think I’m good at what I do. If you look at my record it’s a very, very good one. The search is on for a new manager of Carlisle United after the club parted company with Greg Abbott. He was the third longest serving manager in England but the Blues have had their worst ever start to the season. There has been mixed reaction from fans after the announcement of his departure. Sports correspondent Simon O'Rourke on Carlisle's sacked manager - a survivor who did his best until it wasn't good enough. 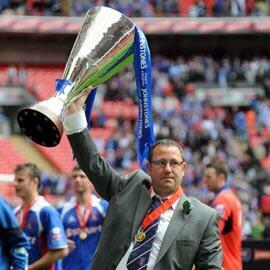 Carlisle United will now start looking for a new manager for the first time since December 2008. Kim Inglis has been gathering reaction to the news of Greg Abbott's departure. Greg Abbott was the third-longest serving manager in the country, and his departure has been met with mixed reaction from the fans. Most people on our ITV Border social media sites are agreeing with Carlisle United on their decision to 'part company' with Greg Abbott. "Right decision, wrong time. Form was poor last year and has continued into this year. " "It's good, but now is the time for board to invest more in the club. Time to start selling the club and the area so we can attract the right players n manager. "I feel that the owners were happy to takeover club but we have not seen any investment from them we as a club need more money investing."